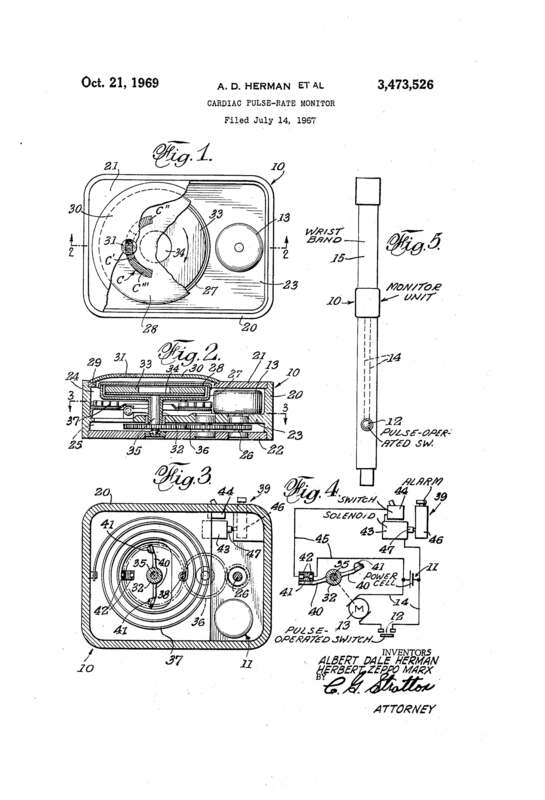 On October 21, 1969, Albert Dale Herman and Herbert Zeppo Marx were granted the patent for Cardiac Pulse-Rate Monitor U.S. Patent No. 3,473,526. This invention was ahead of its time in its defense to aid those with cardiac impairments. Now we are in an era of FitBist® and other smart watches and fitness trackers that can monitor not just your vitals, but your steps, sleep habits, caloric intake/output, etc. Herbert Zeppo Marx, the youngest of the famous comedic Marx brothers, is one of the inventors of this monitor. Many do not know that in addition to being a comedian Zeppo was also a business man, engineer, and inventor with more than one patent. Zeppo was also the founder of Marman Products, which manufactured clamping devices and motorcycles. The clamping devices were used to secure “Fat Man” atomic bombs being transported to Enola Gay in World War II.